16-05-2019 to 16-06-2019. Official website for online form submission for this CG Vyapam Shikshak Vyayam bharti notification 2019. Exam Pattern and Syllabus for CG Vyapam Physical Education Teacher jobs is updated below. 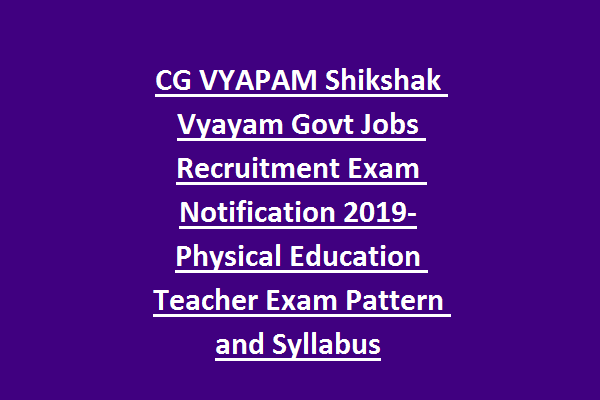 Online application form, age limits, category wise vacancies, exam pattern and exam syllabus pdf and more infor about this CG Vyapam Physical Education Teachers Recruitment 2019 Exam notification is mentioned below. 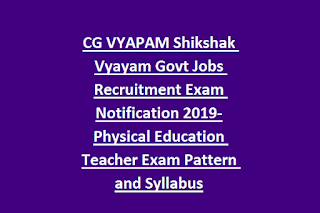 There are total 745 posts in this CG Vyapam Physical Education Teacher vacancy recruitment 2019. Candidates who qualified Degree with B.PEd or its equivalent qualification they are only eligible for this CG Vyapam PET Jobs. Salary is applicable as per the CG vyapam PET norms. Candidates selection is through written exam for this Shikshak Vyayam (Physical Education Teachers) Jobs recruitment 2019. For Chhattisgarh Vyapam Vacancies Physical Education Teachers written Exam will be conducted for 150 Marks. Candidates who qualified B.PEd or D.Ped or its equivalent qualification they can apply online for this Shikshak Vyayam jobs at www.cgvyapam.choice.gov.in. Last date to apply online is 16-06-2019. PET Exam Syllabus PDF, Physical Education Teacher Exam Pattern PDF, PET exam date, CG vyapam PET admit card release date, and PET result and other details are available in this website only.